Involuntary Smiles: Top Ten Reasons Aprons Are Coming Back! Top Ten Reasons Aprons Are Coming Back! I found a new love. I mean it has been in the making for a while now, but just last night it became official. It may be old-fashioned of me, but I love old fashioned. The one I have may not be very flattering on me, but it has great sentimental value (it was either my grandmother's or my great grandmother's apron, so it has seen a lot of use over the years). I have found many uses for aprons. An apron will keep your clothes clean while you are cooking or cleaning. I love my apron, and am anxious to re-build this one, as well as make some others. I have seen some in stores, but honestly, they are not all that cute. An apron must be cute, or reflect something of the personality of the wearer. An apron must not make the wearer feel frumpy. That would defeat the purpose of helping us achieve femininity, which an apron greatly enhances. I have seen some darling ones that friends have made, but honestly, I am too cheap to pay them to make me one. Besides, I need the sewing practice. I have only sewed two things in my life, and both of those were in a sewing class with the teacher standing behind me to make sure I didn't goof up... again. A wrap around skirt (really, how hard can that be? Just hem the edges and stick a button or two on it) and a pair of shorts (which ended up being short!) so my sewing ability is rather dubious. But, you mark my words, as soon as I find some extra money laying around, I am going to rush to the fabric store with it, get me some material, and make a kick-awesome apron which I will wear with pride, and be able to finally retire my dear Grandmother's (or was it my great grandmother's?) apron which is on its last leg. What do you like about aprons? Do you wear one? Would you if you found a super sweet one? funny - I just started writing a blog-post about finding the perfect apron!!! I think aprons are super cute too and I need to get more into wearing them. I've just been reading through your cooking blog and I'd like to come over for dinner every night! Your food all sounds so good. How do you do it while you're pregnant??? I have a hard time. Anyways, I'm going to try your wheat bread recipe and was wondering if you had any tips so the second loaf of bread doesn't go dry before you get to eating it. 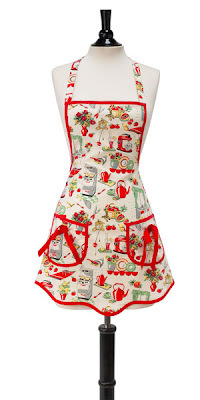 anyways, the aprons, my mom bought me a very cute one for my b-day, it has an adorable cherry pattern! i love it and wear it all the time. AMY!!! What a wonderful comment you left for me!!! I WILL FIND THE PERFECT APRON!!! I LOVE aprons! They are pretty easy, it usually only takes about an hour and a half to make one. plus she has TONS of cute apron ideas, she is the ultimate apron addict! I love aprons too! I'm dying to buy one from anthropologie! They make me feel so domestic! Stopping in from SITS--I just posted on my blog earlier about wanting to make my eldest daughter and myself aprons...funny! p.s. i went to put your button up and can't find it on your page. where has it gone? i had it up and one point and then it stopped working, but thought i had just copy and pasted incorrectly. now it's gone. help?